Tandem streamers produce in the fall according to the experts. I’ve read about this technique and tested it for an hour in September 2012 on a guided fishing outing with Taylor Edrington. Supposedly big brown trout get territorial and aggressive in October and strike out at invading fish and streamers that venture into their territory. Would Wednesday October 23 be an opportunity to test this theory on the Arkansas River? As the 2013 fishing season winds down, I lower my expectations for number of fish and size of fish. 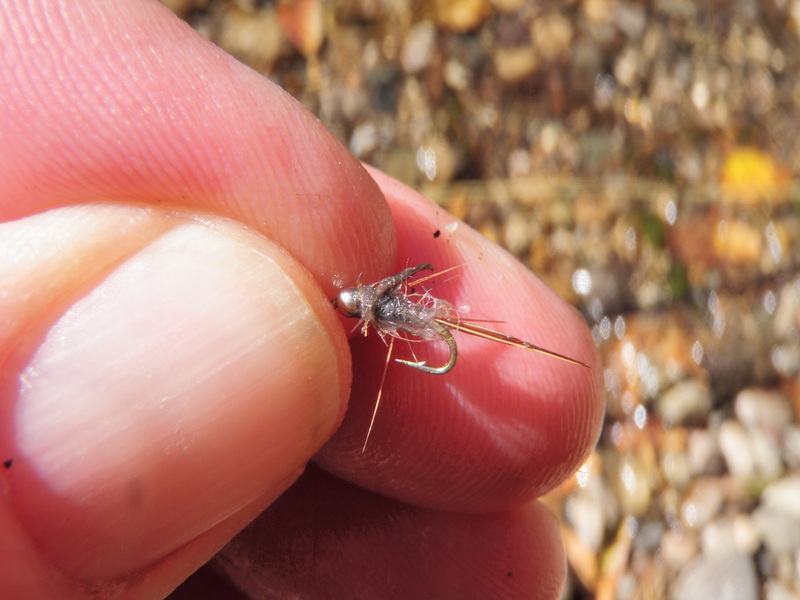 Once the steady stream of aquatic insect hatches dwindle to midges it seems that the fish become less active and I’ve never been very successful at understanding the timing of brown trout spawning and the impact of this event on catching fish. A week of cool weather moved into Denver around the time that I had surgery on the back of my hand, so I took a twelve day break from fishing, but weather forecasts predicted a moderate warming trend during the middle of the week so I made plans to fish on Wednesday October 23. My hand seemed to be healed enough to tolerate exposure to water and highs in the low 60’s were comparatively pleasant for mid to late October. I read the fly shop reports on the Arkansas River, and they were encouraging enough that I decided to make the three hour drive. As I planned the trip I had two goals in mind. One was to use the nymphing rig that I learned from Taylor Edrington that involved a Thingamabobber and level line, and the other was to experiment with a tandem streamer rig on my sink tip line. In preparation for the latter, I found my sink tip line and reel and extracted a length to inspect the leader and sinking tip section. I hadn’t used this line in 20 years, so I wanted to make sure it was in adequate condition for fishing. I concluded it was fishing worthy and made a mental note that it was a 5 weight line. I arrived at the Fremont – Chafee County pullout by 10AM and the dashboard on the Santa Fe registered 42 degrees and this was accompanied by a light cold breeze. I started adding layers including my long sleeve Columbia undershirt, a fleece and my raincoat as a windbreaker, but as I stood behind the car, I still felt cold so I put on my ski hat for temporay warmth while I rigged my line. It took extra time, but I removed my tapered leader and configured the nymph set up that I learned last September; a six inch section of 0X attached via a loop to loop link to the fly line, and then a clinch knot to tie on the Thingamabobber. I clipped off a fresh five foot length of 3X tippet material and tied that to the Thingamabobber and then extended the five foot leader with another 18 inch section of 5X tippet. I crimped a BB split shot above the surgeon’s knot and then tied on a beadhead hares ear. Next I fed the end of a one foot section of 5X through the eye of the hares ear nymph and tied a clinch knot and then tied on a beadhead RS2 as my point fly. I removed my ski hat to put on my wide brimmed hat, but I was instantly met with a cold gust of wind, so I whimped out and put my ski hat back on and left the brimmed hat in the car. I packed my lunch in my backpack, but at this point I expected to return to the car for lunch and exchange hats and also perhaps switch to my 5 weight Loomis rod and that would provide the option of trying my sinking tip line and streamers in the afternoon. I carefully made my way down the crude cement steps and then maneuvered down the rocks to the edge of the large pool below the pullout and carefully waded across the tail. At this point I decided to work my way upstream instead of going downstream as I had done on the previous trip. I was intrigued with the nice pocket water and deep runs along the north bank where I had ended my fishing on the previous Arkansas outing. The nymph rigging and dressing for the cold added precious time to my preparation so that I was finally stationed at my starting point and casting by 10:45AM. I methodically worked my way up along the right bank with the nymphs for 45 minutes without any sign of fish, and I was beginning to despair that I’d made a three hour trip only to be skunked, but just as that thought entered my brain, the indicator dipped and I landed a nice 12 inch brown that attacked the beadhead hares ear. Within the next half hour I landed three more browns in the same size range with the largest being thirteen inches and a victim of the RS2. Suddenly after an hour of fishing I had landed four fish and my outlook had shifted from despair to optimism. By noon I was quite hungry and the sun had risen high in the sky and the air temperature warmed considerably. I was now at a turning point where I needed to decide whether to retreat to my morning crossing point and return to the car for lunch and a hat and rod exchange, or simply find a nice rock in the sun and eat my lunch and then continue on upstream. Since it was late in the season with less daylight and a shorter window of actively feeding fish, I didn’t wish to waste an hour trekking back to the car, so I chose the path of least resistance and ate my lunch on a nice rock next to the river. This meant I sacrificed using my sink tip line and I faced the prospect of fishing in the afternoon sun with no brim on my hat. The decision actually proved to be favorable as I spent the next three and a half hours prospecting the water next to the north bank with my nymph tandem and landed eleven more fish. The most amazing aspect of this day of nymph fishing was that I didn’t lose a single fly to the sticks and rocks on the river bottom despite numerous hang ups. Nearly all my catches were spunky brown trout in the 12-13 inch range with one rainbow landed toward late afternoon. The hares ear nymph produced roughly 75% of the fish, but I switched the RS2 out for a BWO emerger over the last hour and a half, and this fly probably accounted for three fish including the rainbow. I also experienced brief hook ups with two fish that felt heavier, but these fish managed to shake free of the hook in short order. The most productive water proved to be the head of the runs and slicks where the faster current slowed and fanned out into a slower moving pool and passed over a deeper trough in the run. I probably covered a mile of the river over the course of the 4.5 hours of fishing, so I was definitely moving along quickly and there were some lengthly fishless intervals, but overall it was a fun day in late October on the Arkansas River. Tandem streamer experimentation remains as a goal for a future trip in 2013 before the severe winter weather takes control. Those of you reading this blog may accuse the author of fish count padding when you see Clear Creek and 24 fish landed, and yes the 24 fish landed were on the diminutive side. Admittedly landing 24 small fish in 4.5 hours of fishing gives the fish count table a boost, but I did not set out to do this, and besides it is my life and my day off so I can do whatever provides the most fun. 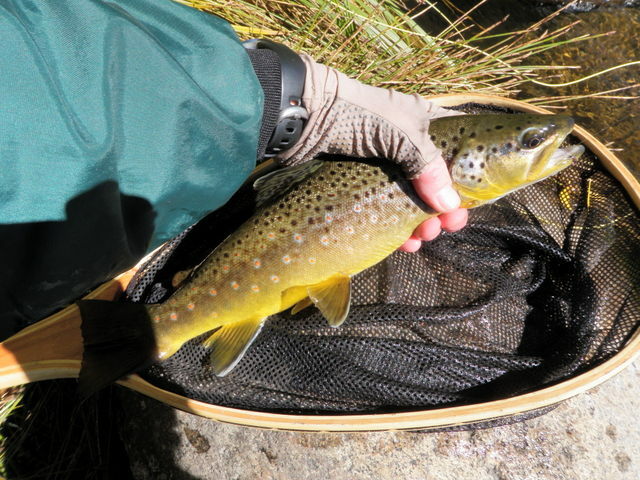 Since it was October 10 I was concerned that brown trout would begin their spawning ritual, and I’ve never had great success fishing in predominantly brown trout drainages during the spawning period. Before and after are generally spectacular, but during is another story. The weather was forecast to be transitional and I didn’t want to make another long trip after driving two hours to the Eagle River on Monday. 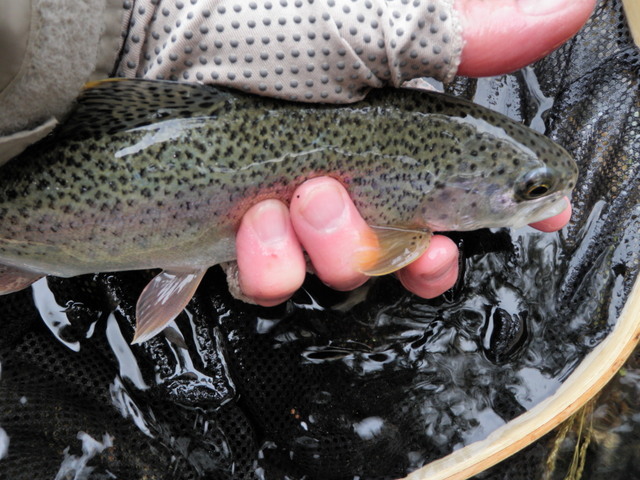 In past Octobers I’ve fished the Big Thompson River and South Boulder Creek during this time period as both of these Front Range streams contain strong populations of rainbow trout, and they are spring spawners. 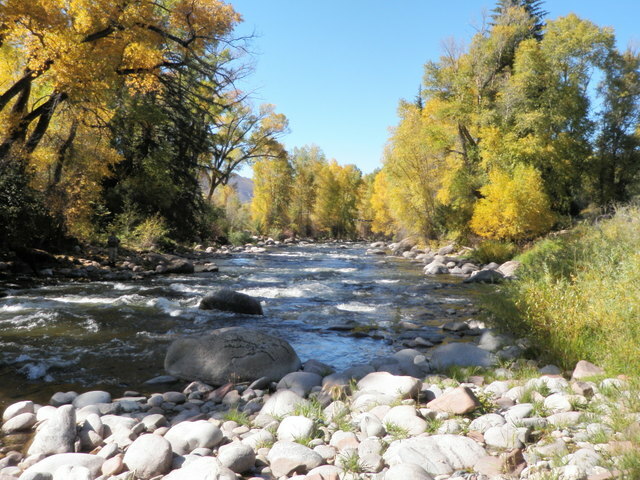 Unfortunately the Big Thompson is out of consideration because of the huge September flood, and the Coal Creek Canyon road to South Boulder Creek below Gross Reservoir is also closed due to the flooding. But wait a minute, there are alternative routes to South Boulder Creek. I went to Google maps and obtained driving directions and the web site sent me up the Boulder Turnpike to Boulder and then on Baseline Road to Flagstaff Drive, and that led over the mountain to Gross Reservoir. That sealed it. I packed all my fishing gear and made a lunch and departed on my way to South Boulder Creek. The high temperature for Thursday was expected to be low 60’s in Denver so that probably translated to a high in the 50’s at South Boulder Creek. That was certainly tolerable with the proper attire, but a front was expected to move in during the afternoon and that would likely yield showers starting at approximately 1PM. I quickly reached Boulder and turned on to Baseline and reached the point where I needed to continue on Flagstaff, but there was a sign that said Flagstaff Drive was only open to residents. What should I do? My wife will tell anyone that listens that I am a chronic follower of rules, but for once in my life I ignored the sign and continued. After half a mile I reached a point where only one lane was open and there was a traffic signal alternating north and southbound vehicles through the single lane. This probably explains the sign about residents only. That was really the only dicey obstacle to my passage however and I continued on the winding twisty drive through the Flagstaff Mountain Park and then down the other side to Gross Reservoir. I had never been to Flagstaff Mountain Park, and it was a beautiful place with scenic views and numerous hiking trails, so it was a nice discovery for future exploration. 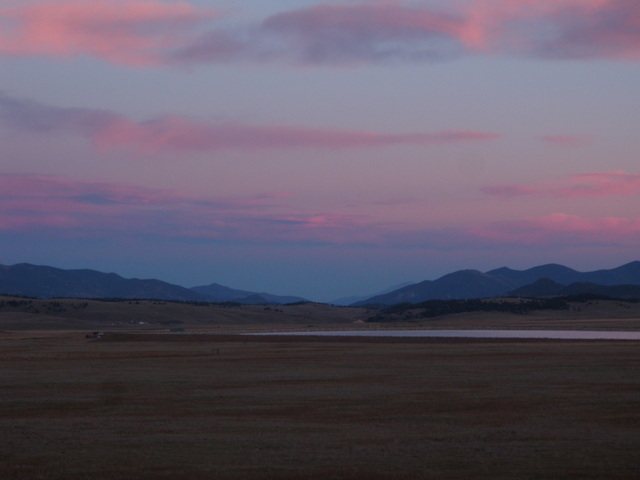 When I approached the reservoir I reached a point where I needed to turn left to continue on a dirt road to get to the parking lot below the dam that is the tralhead for the path that descends to South Boulder Creek. I made the turn and immediately I was stopped by a flag man. I was concerned that I would be reprimanded or fined for ignoring the sign that said residents only, so I began concocting a story to explain why I was on the road. I’d traveled ten miles beyond the residents only sign, so I was skeptical that this would be the case, but concerned nonetheless. Fortunately I waited for approximately 10 minutes and then I was allowed to proceed and after a mile or so I encountered the reason for the stoppage, a road grader working on smoothing out the dirt road. I was relieved to discover that I was allowed to continue and after descending the steep dirt road with numerous switchbacks, I finally reached the destination parking lot and pulled in. There were no other cars and I looked down at the river far below and it looked ideal. The flows were 90 cfs on the department of water resources web site and this falls within the ideal range for the relatively small stream bed. I was ready to begin my preparation to fish when I looked at the entrance to the trail and spotted a yellow ribbon stretched across the south end of the parking lot so I walked over to inspect it more closely. The text on the opposite side of the ribbon said, “Do not cross sheriff’s line”. After the long drive through several obstacles I desperately wanted to duck under the ribbon and descend to the stream to fish, but I was in a disaster relief area and the obedient side of me prevailed and I decided not to ignore the sheriff’s line. What now? I thought I remembered another road that connected with Colorado 119 that could get me to Nederland and then through Blackhawk and down to Idaho Springs where Clear Creek was open and available for fishing. Unfortunately I was out of cell range and the Colorado state map in the glove box was not detailed enough to shed any light on roads in the remote area I now occupied. I decided to reverse my course and once again was forced to wait while the flagmen stopped traffic for the road grader, but eventually I reached the paved road, and there was only one choice and that was to return to Boulder the way I had come. Once I got back in cell range in Boulder I asked my phone for driving directions to Idaho Springs and fortunately there was a route that took me south through Golden so I avoided returning to Denver on the Boulder Turnpike. 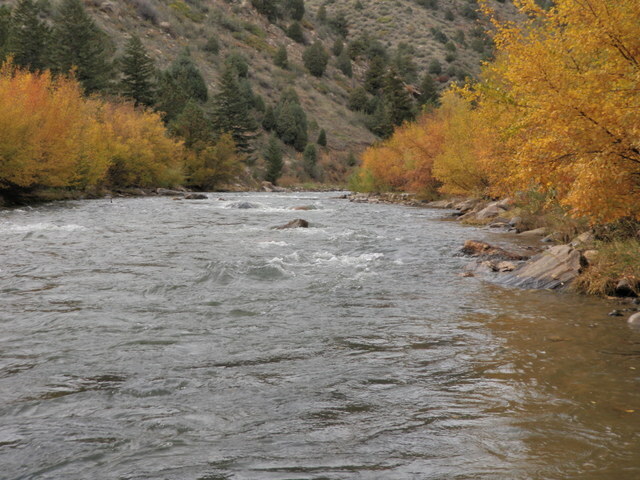 Since I was now ad-libbing I decided to drive up Clear Creek Canyon and check out water that I’d never fished. Route six winds through the canyon and signs along the route actually indicated that the entire canyon stretch is designated as a Jefferson County park. There were numerous pullouts along the way, but I continued along until I’d nearly reached the western end and pulled over in a stetch that appeared to have a lower gradient than much of the canyon water. I was just west of mile marker 261.5 as I ate my lunch in the car at noon. The temperature by now had climbed to the upper 50’s, but I could see large gray clouds moving in from the west, and I remembered the forecast of showers by 1PM so I wore my fleece and raincoat in addition to my ski hat for warmth. After lunch I climbed into my waders and put together my rod and hiked down along the river a bit until I found a place where a rough path angled down the steep bank. 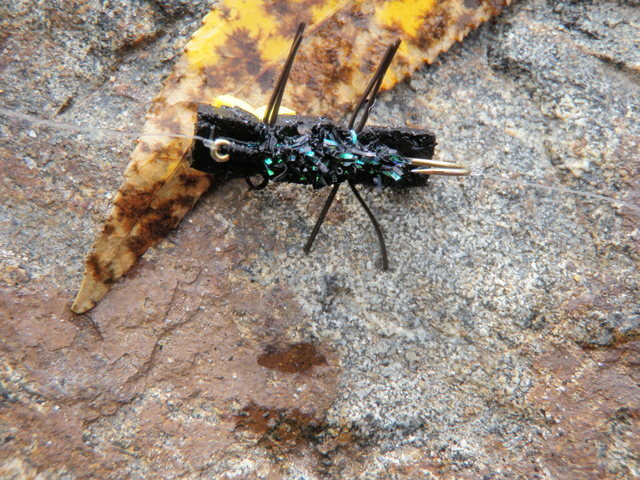 I tied on a Chernobyl ant and added a beadhead hares ear nymph on a fairly long dropper and began to prospect the water. It didn’t take long before I hooked and landed two or three small brown trout on the hares ear, and this would be the norm for the remainder of the afternoon. The dark clouds moved in after a half hour or so and a light rain fell, but I was prepared with my raincoat so I continued fishing through the shower. Eventually the rain stopped and the sky brightened somewhat, but for the most part it was overcast and chilly during most of the afternoon. 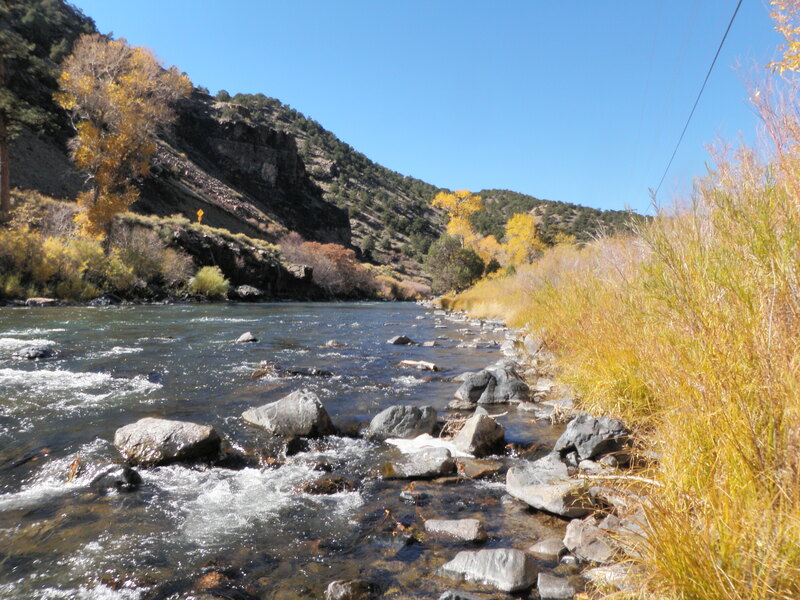 I continued fishing along the north bank of Clear Creek and hooked and landed fish at a nice pace. I fairly quickly learned that most of the fish were tight to the bank and eventually began to ignore all the water except the four to five feet along the edge. Several times I waded through small pockets tight to the bank where there was hardly any current and kicked out two or three nice fish by Clear Creek standards. Although the fish were mostly in the 7-9 inch range, I probably landed three or four in the 10-11 inch class, but also landed 10-15 fish that were below the 6 inch standard that I use to judge whether to count or not. In terms of flies, there was no strategy involved in this type of fishing. I stayed with the hares ear and Chernobyl over the entire afternoon and landed perhaps five or six on the Chernobyl with the remainder grabbing the hares ear as it drifted beneath the surface. There were also quite a few refusals to the Chernobyl ant and a number of fish chomped the foam attractor but came off when I set the hook aggressively causing the flies and fish to come hurtling back toward me through the air. I covered perhaps a mile of stream over the course of four and a half hours of fishing and continuously kept on the move. I adhered to my rule of three casts and move for average water, one or two casts for marginal water and five casts for attractive water. Even though the fish were on the small side, I thoroughly enjoyed my afternoon on Clear Creek. I caught a bunch of fish, covered a lot of water, and explored a new stretch within an hour of my home in Denver. Nine more miles of stream remain along Clear Creek Canyon to be explored in future trips to this accessible area. As I watched Dave G. and Todd land nice fish on the Eagle River on Saturday morning, September 28 at the preserve area near Edwards, I vowed to return and give this attractive stretch of river another look. I knew that Todd was leaving for California for a month on October 8, and as I examined the weather forecast I noted that Monday October 7 was forecast to be a gorgeous fall day with highs in the 70’s in Denver and low 60’s in Edwards. I fired off an email to Todd to see if he had time to fish on the day prior to his departure, and he replied that he could meet me for a few hours. The plan was set and I would meet Todd at the preserve open space between 8:30 and 9:30AM. I got off to a nice early start and arrived in Edwards before 9AM, and as I looked at the dashboard I realized the air temperature was 31 degrees. I was reluctant to begin fishing in these subfreezing temperatures so I stopped at a coffee shop in the Riverwalk area and picked up a cup of hot tea and then sipped it for 20 minutes. By 9:30 the temperature moved to 36 degrees so I prepared to fish. Fortunately the sun was bright and the radiant energy made me feel much warmer than the thirties so I wore a long sleeve undershirt, fishing shirt and raincoat, and this served me well during the morning. I elected to use my Sage 4 weight fast action rod as I planned to do quite a bit of nymph fishing so I removed my tapered leader and rigged for nymphing using the technique that Dave G. and I learned from Taylor Edrington. I tied a six inch section of 0X monofilament to the end of the fly line and then used a clinch knot to tie the other end to a Thingamabobber. Next I clipped a new five foot length of 3X and tied that to the Thingamabobber as well, and then extended the 3X section another foot with 5X. I crimped a split shot above the surgeon’s knot and then tied on a beadhead hares ear and below that a beadhead pheasant tail. As I was configuring my line Todd arrived and when he was set up we hiked to the river together. Todd elected to hike down the south side of the river behind the gravel quarry and fish the deep riffle stretch where he’d done well on September 28. Meanwhile I crossed to the north side and went downstream to the bottom of the first deep run, and I fished upstream in the slow water between the fast current and the bank. I diligently fished the nymphs for quite awhile, but didn’t receive any action so I exchanged the beadhead pheasant tail for a RS2. Eventually I landed three small trout, one rainbow and two browns, on the hares ear but these fish were only seven inches in length. As the air temperature warmed I hooked a somewhat larger brown, but it slid free of the hook and got foul hooked on the trailing RS2, and then I landed an eleven inch brown for my best fish of the morning. I’d landed four fish, but they were small and I was yearning for something bigger. I decided to cross the river and meet Todd to see how he was doing and then return to the car for lunch at around noon. When I met Todd I discovered that he was having another productive morning with twelve fish landed and quite a few in excess of fifteen inches including a 15 inch brown and some large rainbows. 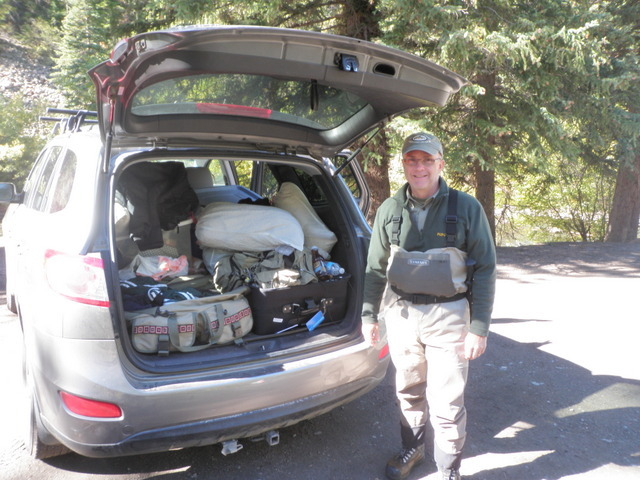 Todd announced that he needed to return to his house to pack and prepare for his trip, so we returned to the parking lot and I ate my lunch while he removed his waders and packed up his fishing gear. After lunch I decided to head to the stretch of water that Todd fished and stayed with the nymphing set up. Todd also mentioned that he was catching most of his fish with a flashback pheasant tail with no bead so I made sure I had a few of these in my fleece pouch before I returned to the river. 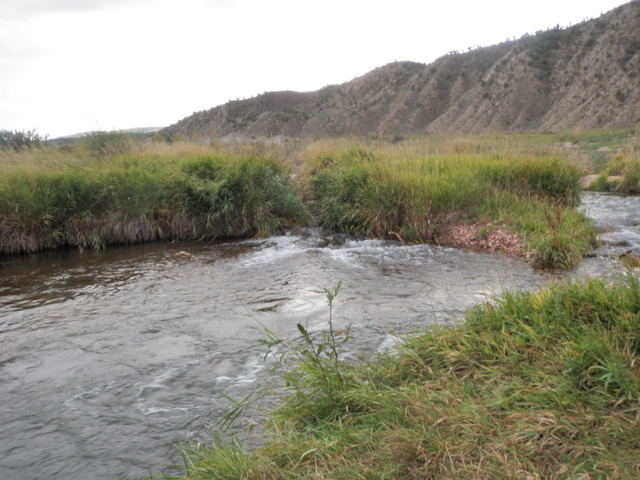 When I found the location of Todd’s success I knotted on the flashback pheasant tail and began to cover the water with casts starting with the deepest water closest to my position and then fanning out systematically. The stretch of water I was in consisted of a deep riffle that spanned the entire width of the river and ran for approximately thirty yards in length. There was a deep trough where I was standing, but the rest of the water was frankly quite nondescript with little to distinguish any part of the water from the rest. I was probably around the middle of the long riffle and I covered the water halfway across with casts three quarters upstream and then allowed the flies to drift past me and then swing at the end. I fished the water in this manner for a half hour or so with no success and I was beginning to assume that Todd hit it at the perfect time in late morning and I was now too late. For some reason, however, I decided to wade out a bit further into the riffle that I’d just fished and made some very long casts to within ten feet of the north bank. I gave the line a big mend and allowed the flies to drift downstream without drag and on perhaps the fifth such cast as the indicator bobbed along a slight current seam it made an erratic slash and I instinctively set the hook. I was pleasantly surprised to feel the pulsing throb of a fish and looked in amazement at a heavy fish thrashing near the surface. I held tight and the fish made a dive and attempted to roll on the line a few times and then it dashed downstream in the fast riffles. I allowed the line to zing from my reel and eventually the brown stopped its downstream sprint and began to come across the riffles. At this point I carefully gained line and eventually the brown came up along the south bank into the deeper trough where I initially stood to fish. After a few more head shakes and dives I lifted the snout out of the water and slid my net beneath a fine buttery yellow brown trout. I carefully waded to the bank and spread the fish on my net where I could snap a quick photograph. 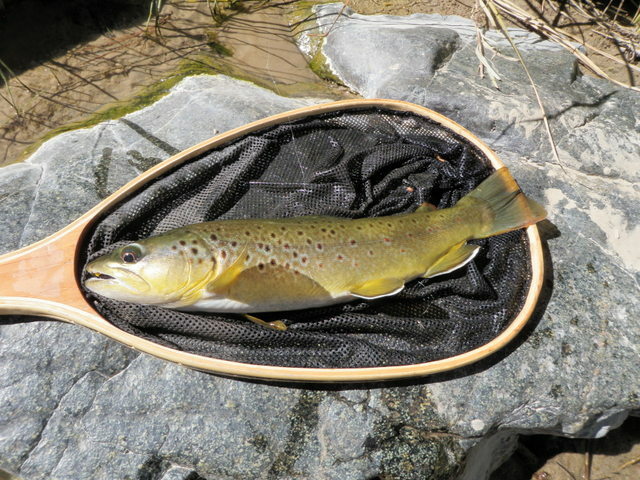 The fat brown extended beyond the net opening by two inches making it a 17 inch speciman and the deep yellow coloration matched the tiny yellow leaves lying on the beach behind my net. I carefully released my prize catch and watched it calmly swim back into the current and disappear. In a state of euphoria I returned to my casting position and continued working the riffle from the middle of the river to within ten feet of the far bank. 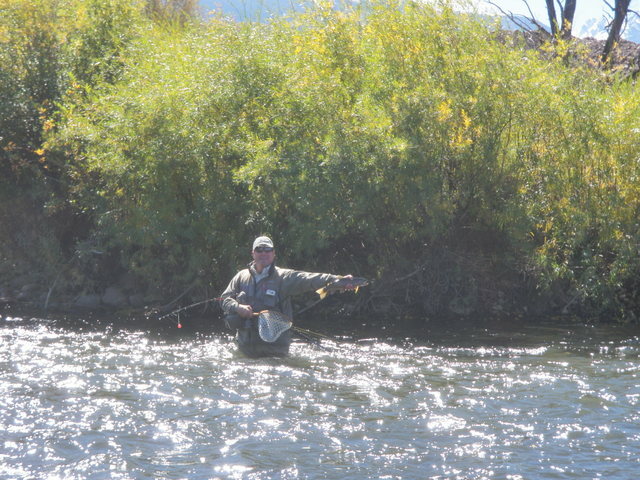 Each time I made four or five casts to cover the water, I followed up with three or four steps downstream and repeated the process in the same manner as I fished the Deschutes River for steelhead. On the next pass after moving three steps downstream another nice fish attacked my nymphs on the swing, and I fought and landed a 15 inch brown. Both fish chowed down on the flashback pheasant tail so I was really thanking Todd for bequeathing this water to me and pointing me toward the working fly. It was too good to be true and I failed to interest any more fish as I worked to the bottom of the riffle where the water became quite shallow, so I moved back up to the top of the riffle above where I’d begun on my first and second passes. On the fifth cast to this upper riffle water the indicator paused and I set the hook and instantaneously a large rainbow rocketed from the river, but before I could get excited, I apparently didn’t lower my rod tip enough or allow enough slack because the fish was off and I reeled up a line that was devoid of a fish. I continued fishing the upper riffle and did hook and land a 12 inch rainbow that put up a valiant fight but it paled in comparison to the one that got away. 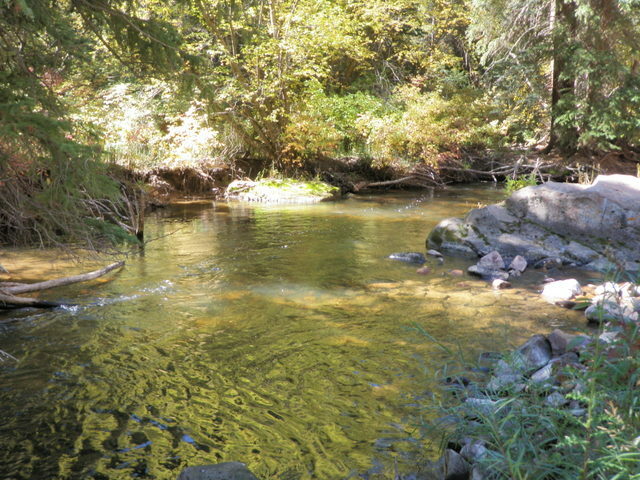 I now decided that Todd and I probably exhausted the golden riffle for the day so I clipped my flies to the keep and moved upstream to the next nice riffle stretch. Unfortunately this didn’t produce any fish nor did the next one and I now arrived at water that was faster and consisted of much more typical brown trout water with many pockets and deep runs and short riffles between protruding rocks. This water was more difficult to fish effectively with the nymph set up so I decided to remove it all and convert to a tapered leader with a Chernobyl ant and then the same two nymphs that I used in the riffles. It took awhile to make the conversion but eventually I was back in business and began prospecting the three fly combination. The sun was now high in the sky and it actually became a pleasant but cool afternoon in the Rocky Mountains. Over the course of the remainder of the day between 2PM and 4:30PM I landed five more fish but these were largely 7-8 inch fish and mostly rainbows. It was nice to have more action but the results did not match my expectations particularly as I was fishing the type of water that normally delivers nice brown trout in the 12-15 inch range. How can I explain the concentration of action to one continuous wide long deep riffle? My theory is that the brown trout are schooling up for spawning and the riffle water type represents the preferred structure for a brown trout reunion. Perhaps the rainbows are tagging along in hopes of scooping up some brown trout eggs? 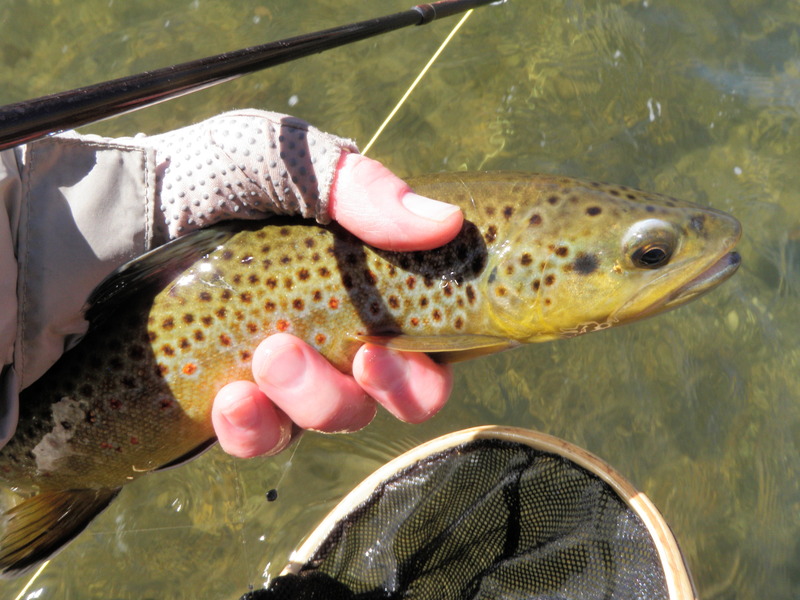 The fish that remain in the habitat occupied by large browns earlier in the season are juvenile browns and rainbows. This was likely my last trip to the Eagle River in 2013, but I’m anxious to give it another try in 2014 when the circumstances are more normal and not impacted by the spawning urge. 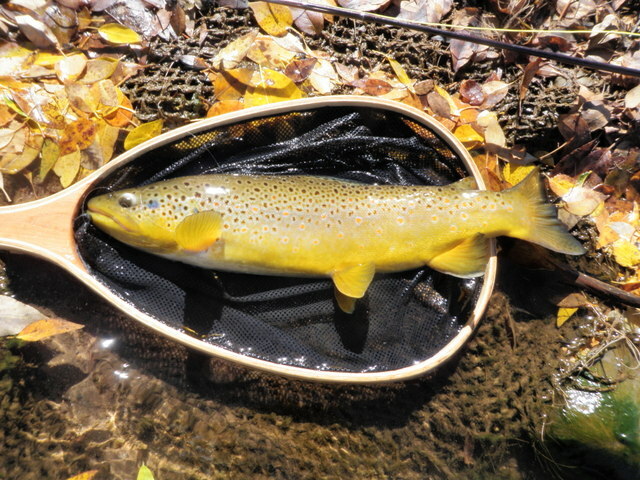 The seventeen inch brown made it a memorable day along with the colorful Aspen leaves and the cool yet pleasant temperatures. I plan to return to the preserve open space and explore again. I’m in love with the Arkansas River. Why? Read on. 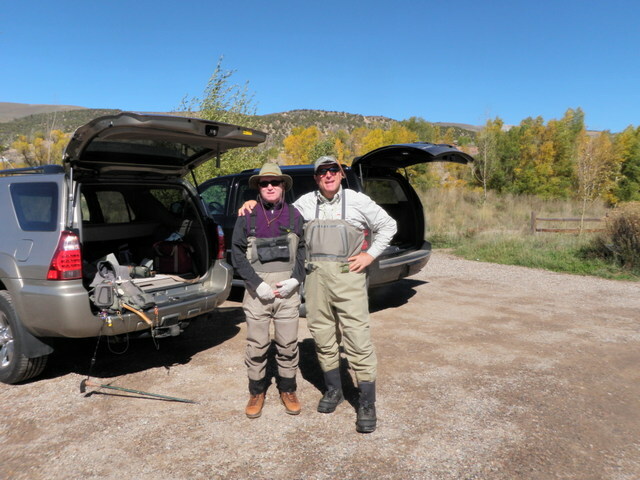 I planned to spend a couple days on the Arkansas River when my friend Jeff Shafer visited in September but the five days of heavy rain and then some heavy thunderstorms the next week caused the river to be off color, so we switched plans and substituted the Taylor River. I love fishing the Arkansas in the fall and Wednesday October 2 offered the first opportunity in 2013 to quench my desire to make the trip and do some fishing. 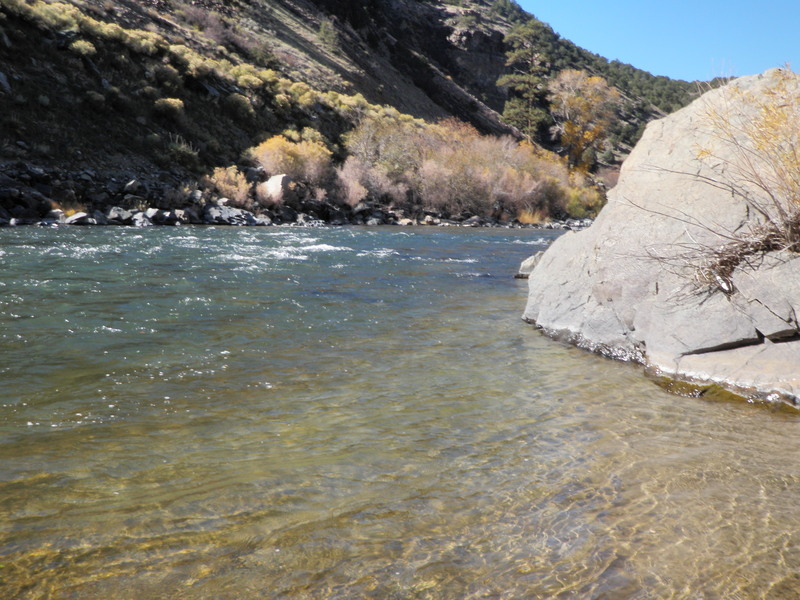 The high temperature was forecast for the mid-70’s and the fly shops reported that the river was once again clear and providing excellent fishing for hungry pre-spawn brown trout. I packed up everything on Tuesday evening except for food and water so that I was able to leave the house by 6:30AM and avoid morning rush hour traffic. Of course this was after discussing the purchase of a second home in Eagle Ranch with Jane and deciding to submit an offer. Jane planned to contact our real estate agent during the day and do whatever was necessary to make a bid. Aside from several five minute delays due to road construction on 285 in South Park, the trip was uneventful and I turned into the pullout at the Chafee-Fremont County boundary at 9:45. The temperature was in the low 50’s as I prepared to fish so I wore my raincoat for warmth and that allowed more room in my backpack for my lunch. I crossed at the tail of the huge pool directly below the Santa Fe and climbed the steep bank to the railroad tracks and then hiked downstream a half mile or so. Here I cut down a gully to the river and then carefully stepped through some rocks to a point 50 yards below the small island. The smaller north channel around the island is my favorite spot on the Arkansas River, and I was trying to manage my day so that I would be on that water in the early afternoon. I originally planned to use my Sage four weight rod and rig up with the nymphing setup that Taylor Edrington taught Dave Gaboury and me on our guided fishing trip in 2012, but I was haunted by the small north channel around the island, and realized the nymphing approach was not appropriate for that water. For this reason I abandoned the nymphing idea and decided to go with the conventional nymphing approach with a tapered leader and strike indicator. The other approach makes converting to dry flies much more time consuming and I wasn’t willing to commit the day to exclusive nymphing. I placed a strike indicator on my tapered leader and tied on a weighted 20 incher as my top fly and as my source of weight and then added a beadhead hares ear nymph. I began searching the nice deep runs and seams with my nymph tandem and much to my surprise went a half hour or so before connecting with a fish. 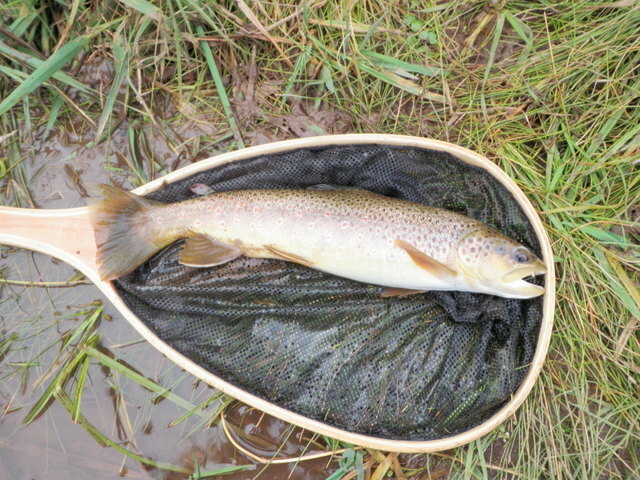 My first fish was a nice rainbow in the 13 inch range and when I got to the more shallow riffles at the top of the run, I landed three more small browns that hit the hares ear. A brief foray up the left side of the island yielded another small brown on the 20 incher and then I returned to the base of the north braid. Because of the large amount of recent rain, I probably could have continued with nymphs as the flows were more like spring levels instead of the usual low clear conditions that prompt me to use a dry/dropper approach, but I was weary of tossing nymphs so I converted to a parachute gray hopper and kept the beadhead hares ear. Unfortunately these flies only produced one medium size brown and I’d covered the gut of the channel where I usually land the bulk of my fish. I decided to make a change and replaced the hopper with a Chernobyl ant, and I also added a RS2 as a third fly. This immediately paid dividends and a nice 14 inch rainbow slammed the Chernobyl and I managed to land it, but it escaped my net somehow before I was able to photograph. I was now optimistic that the north braid would return to super productive status, but now I began getting refusals and on one of these I set the hook and foul hooked a big fish that rocketed downstream and eventually tore off all three of my flies! In a fit of frustration I sat down on the bank and removed my frontpack and backpack and ate my lunch. It was around noon and I’d covered 2/3 of my north braid holy water. Two hours of fishing yielded seven trout, but only the last rainbow was above average size and my sweet spot wasn’t producing. I could go on with a blow by blow description of the flies and approach but essentially there were two distinct periods and I had success during both of them. Initially after lunch I began to see the occasional BWO emerging and fluttering skyward and from the top 1/3 of the north channel until the point where I crossed at the tail of the large pool I had quite a bit of success with the Chenobyl/hares ear/RS2 combination although I broke off a couple RS2’s so I decided to substitute the BWO emerger developed by Charlie Craven. During this time between 1PM and 3PM I landed approximately ten fish and most were in the medium size range of twelve inches. Most of the fish were taking either the hares ear or RS2/emerger and most of the fish were coming from either the tail of riffles and slick areas behind rocks or from the very edge of the river next to the bank. In fact I landed two or three decent browns from very thin runs of water only a foot or so deep. I was quite shocked that I didn’t see these fish as they seemed to just materialize out of the rock and sand bottom. Brown trout possess an amazing camouflage. The belly or midsection of the pools and runs were largely unproductive, and I probably could have saved a lot of time by skipping them. At 3PM the BWO’s were largely absent but a solitary mayfly would appear on rare occasions. I braced myself for slow fishing as is normally the case in late afternoon on the Arkansas River and I was now located on the north bank of the long slow moving pool below the car and pullout. I find this water difficult to fish because it is largely featureless and I was about to circle around it and jump to the next section of faster water with bankside pockets that are much more to my liking. But some part of my brain gnawed at me to be thorough and complete so I decided to quickly cover this water, but rationed myself to one cast within four feet of the bank and then take three or four forward steps and make another cast and continually move along. Guess what happened? Big fish started swirling and chomping on the Chernobyl ant. Fish numbers 17 through 21 were 13 – 15 inch fish that came to my net during this period and most confidently sucked in the Chernobyl. I covered quite a distance between fish, but when one appeared and mangled my fly, it was always a pleasant surprise. Twice I cast with my left hand so I could support myself with my wading staff in my right hand and while doing this, I noticed a swirl to the Chernobyl and set the hook left handed. Because of the size of the fish, the intermittent success, and the pleasant air temperatures I continued on beyond 4PM until finally quitting at 5. I continued to have decent success over the last 1.5 hours, but the emerger and hares ear returned to the flies favored by the trout. Some of this may have had to do with the type of water as I moved into faster water with pockets, riffles and runs. In addition a second wave of BWO’s appeared although the late brood was even more sparse than the earlier emergence. The BWO emerger did, however, begin to shine and accounted for two or three of the fish landed during the late afternoon time period. It was just a great day on the Arkansas River. The sky was brilliant blue and the air temperature rose to the mid-70’s so that I fished without any layers in the afternoon. There was enough insect activity to get the fish active in spite of the bright blue sky and lack of cloud cover. And best of all I was able to prospect with a large buoyant visible Chernobyl ant and catch large fish on it. One couldn’t ask for more late in the season when aquatic insects and terrestrials become scarce due to the freezing nighttime temperatures. I’m already trying to figure out when I can return. If you read my previous blog, you may be wondering about the outcome of the realtor appointments on Saturday morning. Both houses were similar but the one next to the Gaboury’s was furnished and had quite a few additions causing the price to be $35,000 greater. Jane and I actually love both houses and now are trying to decide whether to commit to owning a second home. There are many advantages ranging from a jumping off point for fishing and skiing, but it also represents a significant financial commitment at a fairly late stage in our lives. Stay tuned. Back to fishing. Dave G. arranged with his friend Todd to meet at the preserve open space area near Edwards on Saturday morning at 10AM. Todd is originally from California and spent a long career working for Chevron, and now he and his wife Karen own a home in Arrowhead. Three years ago Todd got interested in fly fishing, and he has progressed rapidly to the point of being a very competent fisherman. According to Dave G. Todd fishes nearly every day except for cold winter days when he puts on the skis and in the process of spending significant time on the water has gained much insight into fishing locations on the Eagle River. Suffice it to say, the preserve water was new to me, and I’m anxious to return and explore it thoroughly. After introductions and gearing up Todd, Dave G. and I hiked down the path by the parking lot to the river, but a guide and fisherman were fishing the opposite shore from where Todd wanted to fish, and since we needed space for three fishermen, we decided to move further downstream. Todd had actually never explored the water this far downstream behind a gravel quarry so we were all undertaking a new experience. I offered to cross the river to the north side at a wide shallow riffle while Dave G. walked down the south shore and Todd found a home in a deep riffle upstream. I targeted a point where there was a jumble of rocks from stream improvement projects and at this point there was a slight bend in the river. The water in this stretch of the river was characterized by long sweeping runs with shallow riffles in between so I decided to fish deep and tied on a 20 incher for weight and then a salvation nymph as my point fly. By this time Dave G. was directly across from me and fishing the other side of the deep run and current seam, and he began catching rainbows on a hares ear and RS2 almost immediately. Based on his positive results I eventually switched to the same flies and had a hook up with a nice fish, but it got into heavy current and broke off the RS2. I shook off my disappointment and worked my way upstream to the wide riffle opposite Todd who was also experiencing exceptionally fine fishing with five or so landed and just as I arrived he landed a 16-17″ brown. Todd was fishing at beadhead hares ear and a beadhead pheasant tail, and he informed me that most of the fish were taking the pheasant tail. Of course I took his advice and swapped the RS2 for a beadhead pheasant tail and progressed up the left side. Finally I landed a small rainbow for my first fish, and it was nice to be on the scoreboard, but my fish didn’t measure up to the beauties that Todd and Dave G. were landing. As I moved along I did begin to enjoy more action and had a few foul hooked fish, but then I finally connected with a nice fat fifteen inch brown that consumed the hares ear in a four foot wide swath of slow water between the bank and the swift main current. Unfortunately I couldn’t even fully enjoy this catch as the flies somehow worked through a gap in the fish’s lip, and I struggled to release it, and eventually snipped off both flies. This forced me to retie both nymphs before moving on. Again I progressed along the north bank and landed a small brown and then in an obscure short pocket I dropped the nymphs for a short drift. This is one of the places where I debate whether to even cast, but because the pocket was so short I made one cast and as I raised my rod to recast further up, another 15 inch brown latched on to the rising pheasant tail. I battled this active fish to my net and photographed it before carefully releasing it back to its environment. At this point I arrived at some nice pocket water and landed another small fish, but I also felt the weight of two decent fish for brief hook ups that resulted in long distance releases. It was just that kind of day. At around 1:30PM Dave G. signaled across the roaring whitewater that it was lunchtime, so I carefully waded across the river and joined my fishing companions for lunch in the parking lot. After lunch we moved to some water further upstream at the eastern border of the preserve. Once again I elected to cross and fish a deep run with the nymphs which remained on my line from before lunch. The run didn’t produce any fish so I completed my crossing and worked my way downstream and changed to a gray parachute hopper and beadhead hares ear. I saw a mass of hoppers along the path on the way to the river, so I was convinced that my gray hopper would produce. It took awhile to remove the nymphs and tie on the hopper and hares ear, but finally I began to prospect the pockets along the bank and landed two small browns. The hopper looked amazingly realistic as it bobbed along on the current next to rocky structure, but apparently the fish were no longer tuned into these tasty terrestrials. The other guys weren’t doing anything with their nymphs so they motioned me that they wanted to move on and once again I made the river crossing to join them. It was now late afternoon and Todd gave some thought to where we could go and experience some different water and came up with the trestle area in Eagle-Vail. We jumped in our cars and made the short trip up interstate 70 and exited at Eagle-Vail and then made a left turn into an apartment complex and eventually parked at the eastern end of the parking lot. Once we descended the steep bank to the river we discovered a huge deep run that ran down the center of the river and fed into a long beautiful pool. By this time the river was almost entirely covered in shadows and Todd and Dave G. moved to the top and midsection of the long run and pool. I elected to wade in toward the end of the run but above the smooth shallow tail and almost immediately I noticed some sporadic rises across and downstream from my position. I stared at the water for a bit and noticed a tiny BWO dancing and fluttering up from the surface so I tied a CDC BWO below my parachute hopper. 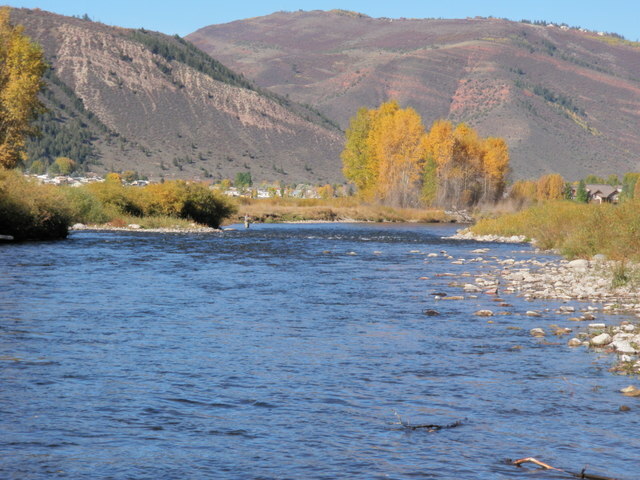 I began casting across the main current and attempted to make downstream drifts to the rising fish, but the wind was blowing upstream and on every cast the wind pushed the flies back upstream of the line. This situation produced almost immediate drag on every cast and I couldn’t get the BWO to land ahead of the other fly and line so that it would drift over the fish first. In addition the sun was very low in the western sky and created a difficult glare on the water. I wasted much of the best hatch time trying to battle these variables before I finally moved to the tail where it was shallow and waded across to within eight feet of the far bank. Now I had better light and the wind was behind me so I clipped off the hopper and tied on the CDC BWO by itself and began casting to a pair of risers to my right and upstream around twenty feet. On perhaps the sixth cast to the target area a fish rose and sipped my tiny imitation prompting me to set the hook and fight a beautiful 13 inch cutbow to my net! It was well worth all the effort and adjustments to be rewarded with this fish. My confidence soared so I worked my way to the far bank and moved up a bit to where I’d spotted rises earlier when the hatch was denser, but by now the BWO’s were gone and the water was calm with no more signs of rising fish. We decided to call it a day and hustled back to Dave G.’s house to prepare for dinner. For some reason I felt jinxed on Saturday, but had fun nonetheless and discovered some new Eagle River public locations to visit in the future. I also met Todd and exchanged contacts as he will most likely be a solid fishing companion on future trips. Dave and Beth Gaboury, our friends from Kansas City, invited us to spend the weekend with them at their home in Eagle Ranch, CO over the last weekend of September. I managed to make great progress on my tasks at work, and Jane was able to take off on Friday so we made the drive to Eagle, CO on Friday morning. Upon our arrival we noticed that the house next to the Gaboury’s was for sale as well as another similar duplex unit down the street. Jane and I discussed buying a duplex unit during our previous visit on the Fourth of July so Jane called a realtor and set up appointments to view the homes on Saturday morning. Meanwhile Jane and I treated the Gabourys to lunch at the Dusty Boot in Eagle Ranch Village, and when we returned to the house Dave G. and I prepared to fish in Brush Creek. Once we were ready, we asked Jane to drive us down Violet Lane to a bridge over Brush Creek and then Dave G. and I hiked along the stream in the open space area to the junction of Brush Creek and the Eagle River. 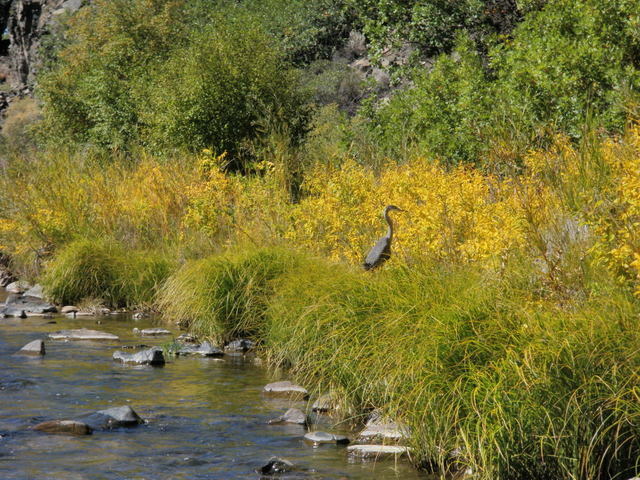 Dave decided to begin exploring Brush Creek, but I was interested in fishing the Eagle River at the confluence first. I put on a strike indicator and then tied on a weighted 20 incher and below that a hares ear nymph and worked the current seam where Brush Creek met the Eagle River. The Eagle River was the color of tea or coffee that had a fair amount of milk added to it, but Brush Creek was crystal clear, so the seam was quite obvious due to the offsetting colors. Unfortunately my plan did not pay dividends as I ran the nymphs along the seam from bottom to top with no results. It was quite chilly Friday afternoon with temperatures climbing to 51 degrees, and I’m sure the high occurred while we were eating lunch as the wind was gusting briskly and dense gray clouds filled the sky above. 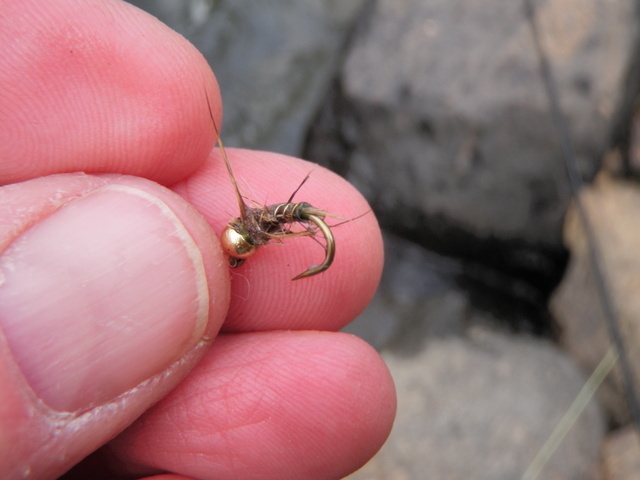 I decided it was time to make my way up Brush Creek and find Dave G., but before doing that I clipped off the nymphs and tied on a Chernobyl ant and hares ear nymph. 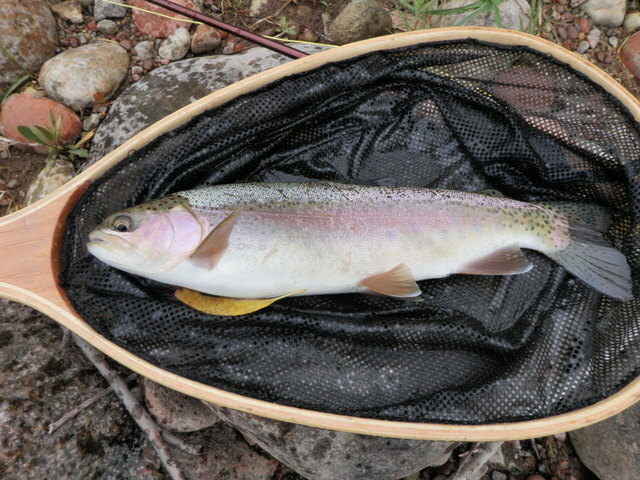 However, before wading up Brush Creek I decided to pop a cast or two into the pocket in the Eagle River that was just above the Brush Creek flume and on perhaps the fifth cast the Chernobyl paused and I set the hook and found myself attached to a hard charging 13 inch rainbow. This changed my outlook regarding the turbid Eagle River and I worked my way upstream along the right bank of the Eagle continuing to toss casts into the pockets and runs within ten feet of the bank. Unfortunately my enthusiasm waned as I was not able to attract anymore fish from the Eagle so I retreated to the mouth of Brush Creek and waded upstream until I found Dave G. who informed me he had landed four fish already. Once we met, we played hopscotch up Brush Creek and in the process I landed eight additional fish beyond the Eagle River rainbow. A couple were small rainbows and the remainder were mostly chunky 12 and 13 inch browns with one 14 inch brown in the mix. I enjoy this type of small stream fishing with an attractor and nymph combination and moving along prospecting all the likely locations. Interestingly I was taking fish from obscure locations and in faster water than normal for brown trout, but I attributed this to the elevated flows resulting from the greater than normal precipitation in September 2013. Eventually Dave G. and I met again just above the bridge where Sylvan Lake Road crosses Brush Creek and at this point the stream branched into two channels. Dave suggested that I fish up the right braid which carried more water than the left to a point where a gate can be opened to redirect the flow of the stream. He proposed circling around this water himself and beginning where the river merged again upstream. I covered this water with no success until I reached the gate that Dave described and just below the gate the channel split around a small island. One part of the current flowed along the bank and the other rushed straight ahead and through a short pocket and then merged perpendicular to the bank current before continuing downstream. I dropped the Chernobyl into the short pocket and on the third cast it paused and I set the hook and found myself attached to a 16 inch brown. After a fairly long dry spell it was encouraging to land a fine chunky fish attesting to the benefit of persistence. Somehow the hares ear got embedded in the lip of the brown is such a way that I couldn’t extract it so I clipped it off and allowed it to remain as a badge of courage. As I struggled to remove the fly and then released the brown I immersed both of my hands in the frigid water, and afterward the combination of the plunging air temperature and the accelerated evaporation effect from the wind caused my fingers to curl and take on the rigid appearance of claws. I struggled to tie on another hares ear and moved upstream but at this point the wind kicked up even more and a combination of rain, hail and snow began pelting me on the back. Frozen hands and a driving snowstorm do not make for enjoyable fishing weather, so I followed the trail in pursuit of Dave G. but after a short while I noticed that the garage door to his house was open so I cut through the field and returned to the warmth of the house. The fishing conditions once again were not amenable to human beings, but apparently quite favorable for fish. In spite of the adverse weather it was an enjoyable and productive afternoon on the Eagle River and Brush Creek. After a great day on Monday I was anxiously anticipating our last day on Jeff’s fishing trip, Tuesday, September 24. The high temperature for Tuesday was forecast to be in the high 60’s with sunshine and no precipitation. These were certainly good conditions for fishermen, but what about the fish? Could I replicate my success from Monday and how crowded would the river be with a lack of cancellations due to inclement weather? We woke up early and packed the car, made lunches, checked out of the hotel and visited Saxy’s for tea again and put ourselves in position to begin driving the road toward Reudi Reservoir by 10AM. 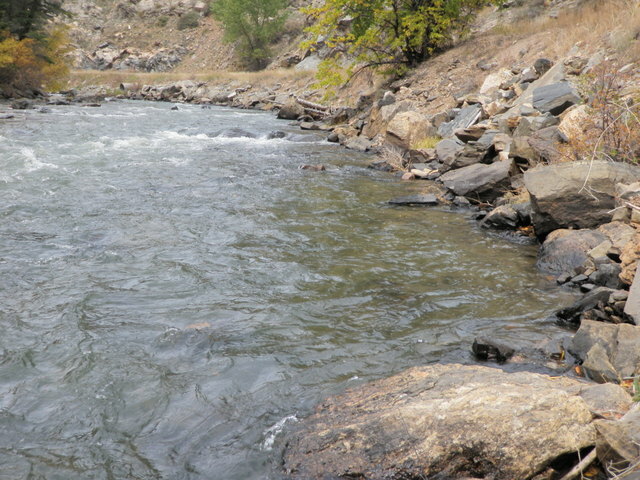 Once again we parked at the large guide lot as this was a nice central point that allowed us to work upstream or down. By 10:30 we were fitted out in our waders and had our rods ready for action. Once again I decided to walk downstream beyond MM12, but instead of stopping at the long island I continued to the stretch of water just above the boundary with the private water where a dead tree spans 2/3 of the river and touches a small island. The sky was a brilliant shade of blue and totally void of clouds and the temperature was in the low 50’s as we began the day. I wore a fleece all day and was never overly warm. As is my custom I tied on a Chernobyl ant and a beadhead hares ear and then a RS2 as my third fly. In order to warm up I began prospecting along the left bank with the three fly combination but generated only a few looks from trout. As I was reaching the top of the run I noticed two fishermen walking my way so I hustled back to the base of the pool to reserve my space. As the pair came into view I realized it was a man and woman and they set up to fish roughly half way between the fast water at the head of the run and my position at the tail. I focused on my fishing and prospected over some fish at the tail with no success so I clipped all the flies off and resorted to the size 14 green drake. This also did not attract any interest and concurrently I began to notice a very sparse BWO hatch so I added a CDC BWO as a second fly behind the green drake. Again I couldn’t entice the visible fish hovering near the surface to take either of my offerings. The other fishing pair seemed to be established at their initial stopping point so I gambled they wouldn’t move down to my area and dropped below the deadfall and worked downstream along the channel closest to the road. When I reached the bottom tip of the tiny island I encountered a deep pool and within the pool two rainbows worked in a circular manner sipping something small periodically. Unfortunately I could not provoke them to sip either of my flies despite fifteen minutes of casting and futile attempts to anticipate their direction and counteract the variable currents in the eddy. After awhile I became frustrated with these challenging conditions and also I worried that I’d lose my prime position at the tail of the deadfall pool before a significant hatch commenced so I moved on. The concern over holding a good position in deadfall pool would repeat itself throughout the day and probably served as an impediment to having a better day. I moved up to the small hidden pool at the top of the right channel, but didn’t observe any rises nor could I spot any fish subsurface in this area that typically holds 4-5 actively feeding fish. I looked upstream and spotted another fisherman working down the right side toward the tail of deadfall pool so I quickly abandoned hidden pool and moved back to the tail of deadfall but I was now on the south side away from the road and opposite the male and female pair that continued to fish from the midsection of the run and pool. The other fisherman above me worked the right edge of the river and passed below me to hidden pool and then downstream. By now the BWO hatch had abated and the sun was quite warm and bright and nothing was hatching so I sat on a rock and ate my lunch at approximately 1PM. After lunch I began to fear there wouldn’t be a hatch due to the bright blue sky, warmer temperatures, and lack of cloud cover so I decided to rig up for nymphs and tied on a 20 incher to imitate the green drake nymph and added a RS2 to match the BWO nymph. I began migrating up the river but stopped to try a tiny pocket where the main river flow angled toward the bank and amazingly a nice fat 13 inch brown nailed the 20 incher and I had my second fish of the day. I had landed a small brown on the green drake comparadun at the tail of deadfall pool just before lunch. Perhaps the deep nymph strategy would pay off. With renewed enthusiasm I advanced beyond the couple along the roadside bank and began working the riffles at the head of the run and on my side of the strong current that split the river. Over the next half hour I enjoyed great fun as the fish attacked my nymphs. Normally I don’t enjoy fishing nymphs as much as dry flies, but when the fish are aggressively attacking them on upstream casts, twitches and mends it can be a lot of fun, and that is exactly what evolved. I landed four fish on the nymphs with a couple in the 13 inch range and had two additional fish that felt heavy but escaped my efforts to net them. The second one broke free suddenly and the pressure I was exerting on the fish caused the flies to rocket back over my shoulder. To prevent entanglement in the bushes and trees I quickly initiated a forward stroke, but I was too late and I snapped off both flies on something. I spent a few minutes scanning the brush but couldn’t spot any dangling monofilament or flies embedded in a branch so I wrote them off and tied on a fresh pair. 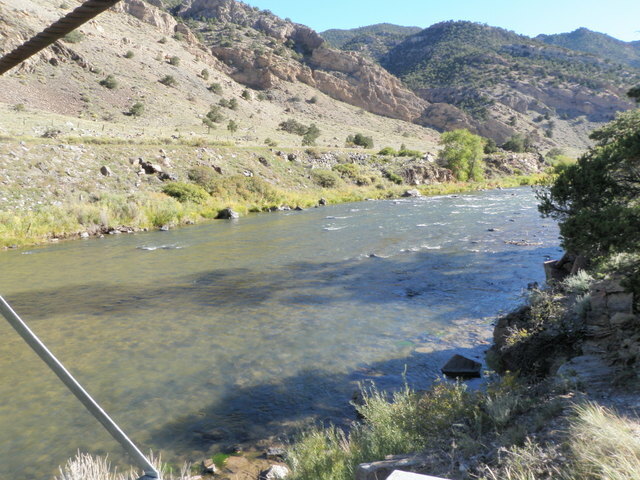 During this time period the fish were attacking the flies at the top of the riffle, slamming them when I lifted to recast, and snaring them as they began to swing at the end of the drift. But change is constant in fly fishing and just when I thought I had things figured out with my nymph set up, the river came alive with green drakes and rising fish so I returned to the tail of the pool and removed my nymphing flies and gear and tied on the size 14 comparadun but this went unmolested in spite of quite a few green drake naturals on the water surface. The green drakes on the water appeared to be larger than the ones I observed on Monday so I gave the parachute green drake a try. This fly was visible and looked great on the water, but the fish apparently didn’t agree. In a fit of frustration I dropped back down to the faster water below the deadfall and managed to land a 12-13 inch brown along the edge of the heavy current toward the base of the pool. Despite this success there were at least four additional fish rising in this small area and they exhibited no interest in the paradrake. This prompted me to return to the tail of deadfall pool where I noticed some fairly regular risers, but again my fly was looked upon with scorn. I decided to ignore these picky eaters and moved up a bit as I felt the good hatch slipping away with my failure to participate. How about the purchased green drake that duped the 19 inch rainbow on Monday? I tied it on to my line and cast it above a pod of rising fish, but again the fish weren’t impressed. For a short period there were 5 or 6 trout rising in the shallow flats along the right side and just 10 to 15 feet above me, but this was in the shadows and the fly was difficult to see. Nonetheless I popped some casts over this pod of risers and not a single fish responded. Yesterday’s joy shifted into Tuesday’s frustration. Once again I waded up the pool a bit and targeted some risers more to the center of the river in the sunlight and now I noticed quite a few PMD’s joining the green drakes, and I began to wonder if the fish had switched away from green drakes to PMD’s? First I tied on one of the size 16 cinnamon comparaduns that I purchased at Taylor Creek Fly Shop, but this fly looked too large so I moved to a quill body melon dun that I’d also purchased in a size 18. This looked like a much more representative imitation on the water to me but apparently not to the fish. Finally I resorted to my bedraggled size 18 one fly wonder that produced twelve fish on Monday, and the fish snubbed this fly as well. 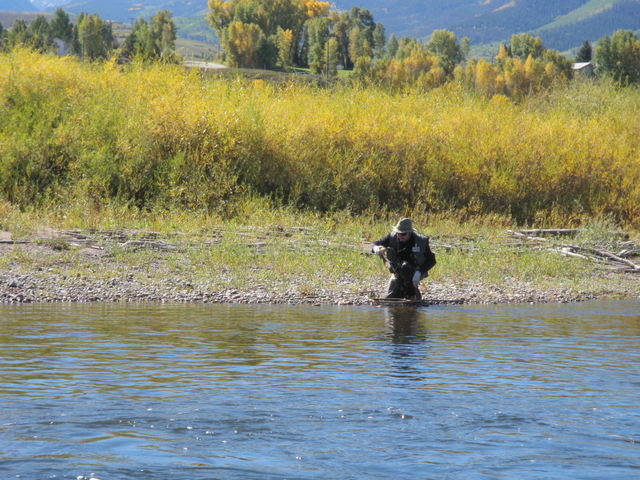 At this point I decided to abandon the tail to seek faster more forgiving water so I began to move back to the faster riffles on my side at the head of the run. On my way there I switched from the PMD back to the purchased green drake cripple and dropped a cast into another small pocket along the bank where the river angled away from the main channel. Thwack! A brown rose and took the green drake so maybe my luck was improving. I proceeded to the top and I was now just above the male member of the fishing tandem who was sending out long casts across the main center current to the riffles on my side. I got off a few casts and then the crazy wet wading fisherman who was showing off his long ineffective distance casting shouted out that I caused him to lose a fish. It wasn’t clear to me how I caused him to lose a fish, but I realized I was dealing with a lunatic so I apologized and moved upstream beyond the fast water via the woods which made for some difficult bushwhacking. Next I was across from tree rock again and spotted two browns feeding in the low smooth water so I placed some decent green drake casts over these fish but again they appeared to be sipping something minute. I waded below tree rock pool to gain a better casting position and then tried a money fly but this didn’t produce. I looked closely at the water but couldn’t really see any food source that could be prompting the sipping rises so I gave up and focused on the angled riffle in the later afternoon shadows. I had great difficulty seeing the money fly in these shadows so switched back to the green drake but to no avail. I gave up on this area as there was another fishermen 20 yards above me and crossed to the road and then hiked up to the top of the island across from rectangular rock pool. The river was totally in shadows here and no bugs were on the water and nothing was rising so I decided to try nymphing again. I returned to the 20 incher and combined it with a yellow caddis pupa after having seen quite a few caddis dapping the water. I worked the nymphs upstream through some juicy pockets on the left side above the island and then covered all the slack water between the bank and the swift current in the chutes area before exiting at MM12. I was now quite chilled from cold feet and being in the shadows and the air temperature was dropping rapidly so I returned to the car and waited for Jeff. My attention now turned to the long drive back to Denver. If I had Tuesday to do over again, I would not focus on saving my position in a single pool and instead would move about and fish more obscure locations. This worked on Monday so I’m not sure why I obsessed with holding my spot at the tail of deadfall pool.